As of 2011, metro Atlanta was the ninth-largest media market in the United States. Due to apparent over-estimates of population growth in the 2000s by the U.S. Census Bureau, this rank is a decrease from two years prior as a result of the 2010 U.S. Census. In 2009, metro Atlanta was the eighth- or seventh-largest market, with over 2.3 million TV households and 4.3 million people aged 12+. According to the 2016 Nielsen Media Research, it ranked ninth in television broadcasting, behind the [Boston, Ma. metropolitan area]. According to 2016 Arbitron, it ranked eighth in radio broadcasting, now just ahead of the Philadelphia metropolitan area and not far behind the greater Washington, D.C.metropolitan area. Cox Enterprises, a privately held company controlled by siblings Barbara Cox Anthony and Anne Cox Chambers, has substantial media holdings in and beyond Atlanta. Its Cox Communications division is the nation's third largest cable television service provider; the company also publishes over a dozen daily newspapers in the United States, including The Atlanta Journal-Constitution. WSB AM, the flagship station of Cox Radio, was the first broadcast station in the South. The Atlanta metro area is served by many local television stations, and is the eighth-largest Nielsen designated market area (DMA) in the U.S. with 2,310,490 homes (2.0% of the total U.S.). Atlanta is a major cable television programming center. Ted Turner began the Turner Broadcasting System (now merged with Time Warner media conglomerate) in Atlanta, where he bought a UHF station that eventually became TBS. Turner established the headquarters of the Cable News Network at CNN Center, adjacent today to Centennial Olympic Park. As his company grew, its other channels – Cartoon Network, Boomerang, TNT, Turner South, Turner Classic Movies, CNN International, CNN en Español, CNN Headline News, and CNN Airport – centered their operations in Atlanta as well (Turner South has since been sold). Also now fully part of Turner is truTV. The Weather Channel, owned by Landmark Communications until it was purchased by NBCUniversal, Bain Capital, and The Blackstone Group in September 2008, has its offices in the nearby Cumberland/Galleria edge city. The first nationwide music video programming on cable television, Video Concert Hall, a precursor to MTV, was created in Atlanta. The Atlanta area has 13 full-power TV stations, running a total of 27 TV channels from 27 TV networks and local sources. Over-the-air digital subchannels are shown as subitems, the main channel is always on the x.1 subchannel and is or was simulcast on analog (over-the-air and cable). Cable listings are shown for Comcast, the dominant local broadband TV provider. For digital cable, three-digit whole numbers are for set-top box users, while decimal numbers are in-the-clear (non-encrypted) QAM for cable-ready ATSC tuners, and have occasionally been changed. These numbers are the physical RF TV channels and the transport stream identifier (TSID) as they are transmitted from the headend; however, some are mapped with PSIP to have the same number as over the air. For HDTV stations, an SDTV version (often a separate feed) is mapped on set-top boxes to the original analog cable channel number. Since March 16, 2009, all Atlanta TV stations that air local news are now in HD, with WXIA 11 first, then WSB 2, followed by WGCL 46, and WAGA 5 last. Surprisingly, LPTV channels 4, 47.1, 47.2, 47.3, and 53.1 are also carried on Comcast digital cable (on 249, 18 [1018 HD], 389, 390, and 263 for former Wometco systems), even in the most limited basic service tier, even though must-carry does not apply to LPTV stations. Charter carres 4, 32.10, 47.1, and 47.2 on 210, 85/224, 102, and 24. Even more unusually, channel 4 is also carried on DirecTV. There are also numerous local radio stations serving every genre of music, sports, and talk radio. The nationally syndicated Neal Boortz and Clark Howard shows are broadcast from Atlanta radio station WSB AM 750. Atlanta is also where Sean Hannity and Ryan Seacrest got their starts—Hannity filling Boortz's seat at WGST AM 640, and Seacrest as a radio personality at WSTR FM 94.1. Other notable radio personalities have included Leslie Fram and Elvis Duran (both now in New York), Rhubarb Jones, and voice talent George Lowe. Familiar Atlanta Braves announcers have included Skip Caray, Larry Munson, Don Sutton, and Pete van Wieren. Cox Enterprises, which owns the Atlanta Journal-Constitution and WSB-TV/FM/AM, is headquartered in Atlanta. Cumulus Media engages in the acquisition, operation, and development of commercial radio stations in mid-size radio markets in the United States and is also headquartered in Atlanta. As of the end of 2005[update], it owned and operated 307 radio stations in 61 mid-sized U.S. media markets and a multimarket network of five radio stations in the English-speaking Caribbean. Stations in grey are considered "rimshots", normally reaching only part of the metro area clearly. In addition, several other smaller stations serve the suburbs. WUBL FM 94.9 Atlanta (country "94.9 The Bull"), iHeartMedia, Inc.
WUBL FM 94.9 and WSB-FM 98.5 are the primary entry points to the state of Georgia Emergency Alert System, taking emergency messages from the governor of Georgia, GEMA, or U.S. president, and relaying them to all other stations across the state. WFSH-FM carries a Christmas music format from just before Thanksgiving until Christmas Day. Since 2011, WVFJ-FM also does so, with WSB-FM dropping it a couple of years later. 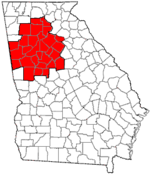 In adjacent areas, WSRM 94.5 Coosa does the same in northwest Georgia. The major daily paper in Atlanta is The Atlanta Journal-Constitution. Several alternative weekly publications are also distributed, including Creative Loafing, The Sunday Paper and the Atlanta Nation. A monthly newsprint publication Stomp and Stammer features local music news, indie rock record reviews, and cultural commentary. The Maroon Tiger (1925-present), bi-weekly, the critically acclaimed student newspaper of Morehouse College. The Emory Wheel (1919-present), weekly, award-winning student newspaper of Emory University. In its history, Atlanta has had many other daily and weekly newspapers, starting with its first weekly, The Luminary (1846), and its first daily, the Daily Intelligencer (1849). ^ "Arbitron Radio Market Rankings - Fall 2016". Arbitron.com. 2009-10-14. Retrieved 2012-01-20. ^ "About Cox". Cox Communications, Inc. Retrieved 2007-08-22. ^ "Nielsen Reports 1.3% increase in U.S. Television Households for the 2007-2008 Season." Nielsen Media Research. (September 22, 2007) Retrieved on April 29, 2008. ^ "Entertainment and performing arts". AtlantaMaps.net. 2008. Archived from the original on 2008-05-16. Retrieved 2008-05-06. ^ "Top 10 Georgia Daily Newspapers". Cision. August 1, 2012. Retrieved 20 July 2015. "US Newspaper Directory: Georgia: Atlanta". Chronicling America. Washington, D.C.: Library of Congress.